In 1996, he obtained a graduate degree in Physics from the Universidad de Valladolid. In 2002, he received a PhD degree in Physics, for the design and fabrication of an artificial olfactory system for the detection of aromas. His PhD research activity was supervised by Prof. Jose Antonio de Saja Sáez, head of the department of Matter Condensed Physics. From the same University, he also obtained a graduate degree in Electronic Engineering. From March 2003 to January 2005, he was a postdoctoral researcher at the Lawrence Berkeley National Laboratory (USA). The research activity was supervised and financed by Prof. Carlos Bustamante and Prof. Alex Zettl, from University of California, Berkeley. His post-doctoral research was the development of ultra sharp atomic force microscope tips based in carbon nanotubes. The main objective of this research was to improve the resolution in the image acquisition of biological systems (DNA, molecules). 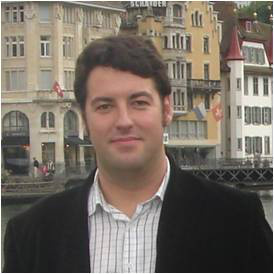 In 2005, he starts as a Juan de la Cierva researcher at the Instituto de Microelectronica de Madrid. He joined the group of Prof. Ricardo García for learning nanolithography techniques by AFM. To complete his technical formation, in 2006 he spend 3 months of postdoctoral stage at the National Research Council of Italy, in Bologna. Under the supervision of Prof. Fabio Biscarini, head of the department of the Intitute for Nanostructured Materials, he learned microcontact printing technology and others soft lithography techniques. Back at the Instituto de Microelectronica de Madrid, he developed a new prototype of parallel nano-oxidation machine. This prototype can perform oxidation motives of a few nanometers along large areas of mm2 in less than a minute. Also, the strong background obtained in AFM and microelectronic techniques has led him to create silicon nanowire transistors with channels of few nanometers. The silicon nanowire transistors can be used as sensors for molecular recognition at the nanoscale. In April 2011 he moved to the Technical University of Madrid as a professor I3 in the Institute of Optoelectronic Systems and Microtechnology (ISOM). His research interest is focus in the development of nanoelectronic devices fabricated with graphene. Also he is researching in ordered nanoLEDs for efficient light emission.